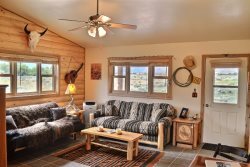 Wapiti Peek is a family cabin just added to the Vacation Rental market for the 2019 season. This gorgeous home is located in the heart of the Wapiti Valley just 30 minutes from Yellowstone National Park. Boasting incredible views, a wrap around deck, creek frontage and forest setting this home is the perfect Wyoming getaway. The historic town of Cody, Wyoming is also 30 minutes away, make sure to take in the Cody Nite Rodeo and tour the Buffalo Bill Center of the West. While there is a full kitchen and gas bbq grill at the house, the Wapiti Valley is home to several great restaurants. Hiking, biking and fishing is within minutes of Wapiti Peek. Don't wait to book this great property.